Politics, philosophy, theoretical physics, logic puzzles! If it gives you brain-aches it's fair game. So scoop your fried brainjuice into a bucket and start thinking! Its been a while since I've made a longer post. I have decided to publish something that I wrote a while back. This is not new, but after looking through it I found that most of the ideas were still relevant. 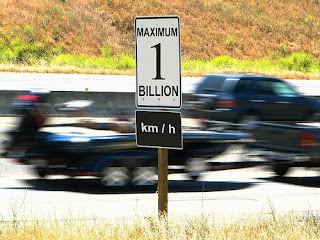 Contrary to popular belief, even among traffic engineers, it is not speed that makes a driver dangerous, but a combination of other factors which may or may not include speed depending on the situation. From a purely scientific viewpoint, speed, until you reach the speed of light and cause strange things to start happening, is completely harmless. We are spinning through space at speeds so extreme we can hardly fathom what it would be like to pass an object at that speed. Some of us ride bullet trains or maglev trains that reach speeds as high as 360kph. Travellers ride on jets going down the runway at speeds faster than those most cars are capable of. Despite these many instances of speed people’s daily lives, the belief that “speed kills” is still widely held. If anything, all these examples of safe speeding should tell us that it is possible to design our cars and roads in a way that permits rapid and safe use as well. In 1974 the Federal Government of the United States mandated that all states lower their speed limits to no more than 55 miles per hour. At that time, a lot of freeways were posted with limits similar to those found in rural western states today, namely 70-80 miles per hour. While proponents of lower speed limits cite the fact that traffic fatalities dropped after the implementation of the national speed limit, it is likely that the drop in fatalities was a result of several other factors. - The gas crisis meant people couldn’t drive as much. No gas, less drivers, less accidents. That’s logical. - Car technology has continuously evolved creating faster and safer vehicles. -The 55 mile per hour speed limit was ignored on a widespread basis, and some states even aided scofflaws by capping tickets at 65 miles per hour enabling them to travel 75, twenty miles an hour over the speed limit, while only having to fear a 10 mile an hour ticket which had been reduced in price to about $5. The police realized that they had better things to do than harass drivers who were driving a completely reasonable speed. If technology continues to evolve, and cars get safer, faster, and more efficient, why are we dropping speed limits and not raising them? The biggest threat to road safety in the US is untrained, incapable, and intoxicated drivers. Our driver training programs are a joke. There are countless cases of people being taught about driving for a few hours one afternoon, going to the DMV, and passing the test. Drivers training should be an ordeal. It should be intense, difficult, and thorough. Not everyone will pass; as a matter of fact, some people will never be able to get their license, because some people are simply incapable of driving in a way that provides for the safe and rapid conveyance of traffic. Signing and striping should be standardised throughout the US. While it may not be immediately possible, US signage should be standardised to be similar to that of Europe, one of the most advanced, and car saturated locations in the world. Europe’s use of symbols rather than textual legends, and dedication to good traffic engineering and extensive public transit is an excellent example to much of the world. Additional examples are the UAE, Japan, and parts of China. Drivers should be required to recognise all signs and symbols, know the unsigned laws of the road. They could demonstrate their abilities with hours in a driving simulator that automatically records performance data. Emergency driving could be taught on a local racetrack. Image Credit: jpctalbot under a creative commons licence. Unless otherwise stated all portions of this work are licensed under a Creative Commons Attribution-Noncommercial-Share Alike 3.0 Unported License.